Gains in technology companies, retailers, health care and internet stocks drove the broad rally, which gave the benchmark S&P 500 index some breathing room after it slid Monday to just shy of what Wall Street calls a bear market — a 20 percent fall from an index’s peak. Wednesday’s gains pulled the S&P 500 back somewhat from the brink of a bear market, where it finished after a shortened trading session Monday. That would mark the end to the longest bull market for stocks in modern history after nearly 10 years. Stocks fell sharply Monday after President Donald Trump lashed out at the central bank. Administration officials had spent the weekend trying to assure financial markets that Fed chairman Jerome Powell’s job was safe. On Tuesday, Trump reiterated his view that the Federal Reserve is raising interest rates too fast, but called the independent agency’s rate hikes a “form of safety” for an economy doing well. “The market is trying to find an equilibrium between earnings, revenue growth and the economy, but when you have an onslaught of headlines that just manifest uncertainty from Washington, it just feeds negative sentiment,” said Quincy Krosby, chief market strategist at Prudential Financial. 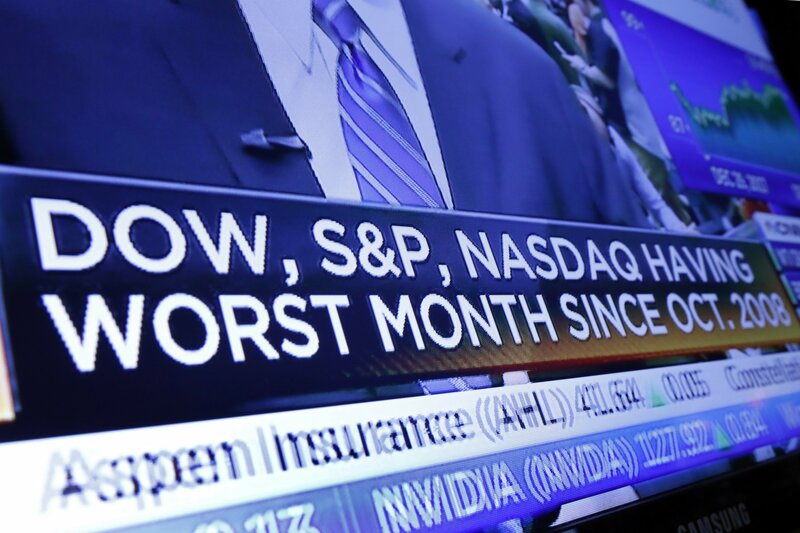 The market’s sharp downturn since October intensified this month, erasing all of its 2018 gains and nudging the S&P 500 closer to its worst year since 2008. Despite Wednesday’s rally, stocks are on track for their worst December since 1931, during the depths of the Great Depression. Technology stocks accounted for much of Monday’s early bounce. Adobe rose 6.1 percent to $217.71. Payment processors Visa and Mastercard also headed higher. Visa added 4.3 percent to $126.99, while Mastercard gained 4.2 percent to $182.05. Big retailers were among the gainers. Amazon climbed 6.9 percent to $1,436.47. Kohl’s gained 8.3 percent to $64.75. Nordstrom picked up 4.2 percent to $46.06.